Unless you’ve been living under a powdered wig, you’ve heard that the revolutionary Broadway musical Hamilton is bringing its historical hip-hop stylings to a San Francisco stage this spring and summer. Months before it will even open, Hamilton has already become the hottest ticket in town and probably the hottest theater ticket this town has ever seen. Even though Hamilton will run for nearly six whole months (March 10th-August 5th, 2017), tickets for almost all 165 San Francisco performances sold out in about the first 24 hours of public sales. What makes Hamilton so special? Why does Hamilton make Book of Mormon tickets look like they were easier to get than parking tickets? The brainchild of rapper and Broadway star Lin-Manuel Miranda, Hamilton won 11 Tony Awards and a Pulitzer Prize as a hip-hop infused musical biography of founding father, first Secretary of the US Treasury, and guy on the $10 bill Alexander Hamilton. Tickets to this show on the resale market will pretty much cost you a US Treasury, and then some. But if you’re committed to not throwing away your shot to see Hamilton in San Francisco, you can still get tickets if you’re young, scrappy, and hungry enough. We’ve got the details below, plus the latest on who’s being cast in Hamilton and the best Hamilton music you can score at record shops or online. Although no official announcement has been made, Hamilton ‘s San Francisco run is likely sold out. Never fear, tickets can still be acquired! For every single performance of Hamilton in San Francisco, there will be a “day of show lottery” wherein 44 lucky people will win tickets for the price of just $10 apiece. (Quite appropriate, since Alexander Hamilton appears on the $10 bill). The Orpheum Theater’s parent company SHN SF has not yet announced details of the day-of-show lotteries, but they have confirmed on Twitter that there will be a daily lottery for orchestra seats for all performances with details to be announced. That means you’ll want to follow SHN SF on Twitter and Facebook to get these details when they’re made available, or at least check those social media pages pretty darned regularly for updates. If the ticket lotteries are anything like the madhouse scenes at Hamilton’s Broadway run, you should not expect lottery tickets to be an easy acquisition. Every SHN SF production has different lottery ticket procedures, and we can’t be sure what these procedures will be for Hamilton. But if we use the Orpheum Theater’s humongously sold out 2013 Book of Mormon production as an example, lottery participants were required to show up two and a half hours before curtain time. Participants could request one or two tickets. Winners were drawn at random, two hours before the performance, and then required to pay cash for however many tickets they’d requested. So if you went for Hamilton rush tickets with a date, it’s possible you could both get in for $20 cash. It’s far more likely that neither of you would end up getting in, but there’s a chance. And it’s a low-risk, high-reward chance that may merit trying more than once. If you expected scalpers to poison this Hamilton run by gaming the system with greed and price manipulation, you won’t be disappointed. As of press time for this article, we found $524 balcony tickets selling for $15,000 apiece on a popular ticket resale site. That said, SHN SF’s efforts to discourage Hamilton ticket scalping -- including a six-ticket limit and a “tickets delivered by snail mail only” policy -- does seem to have succeeded in getting tickets to people instead of bots. Social media was flooded with human-account success stories at getting Hamilton tickets on the first day December 12th ticket sale, when $100 to $197 seats were still available. We don’t currently know who will be in the Hamilton San Francisco cast, but we know who will not. The multiple Tony-winning original Hamilton cast has been extended on Broadway through November 5th, 2017, so those performers won’t be coming to San Francisco anytime soon. This therefore excludes Lin-Manuel Miranda, who has announced he’s leaving the Broadway cast anyway effective July 9th. It also excludes Oakland native and Berkley High grad Daveed Diggs, who won himself a Tony award in the dual role of Lafayette/Thomas Jefferson. Diggs leaves the Broadway cast July 15th. For updates on Hamilton San Francisco casting, keep an eye on the SHN SF Twitter and Facebook accounts or sign up for email alerts under the SHNews header on its website. But if you don’t have thousands of dollars to squander on Hamilton tickets, nor the time or patience to play the highly unreliable ticket lottery game, do you have to just settle for the Hamilton original Broadway cast soundtrack and an epic case of FOMO? No, you do not. You can do better. An outstandingly awesome musical concoction called The Hamilton Mixtape was just released and immediately debuted at No. 1 on the Billboard charts. 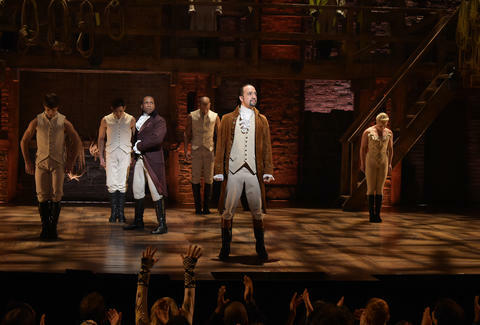 To say that The Hamilton Mixtape is star-studded is a historical understatement. It features Usher, Alicia Keys, The Roots, Wiz Khalifa, Sia, Chance the Rapper, John Legend, Kelly Clarkson, Aloe Blacc, and many others in a track-by-track celebrity reinterpretation and remix of the Hamilton soundtrack. Heck, even Jimmy Fallon makes an appearance on this mix. So whether or not you are able to score that highly coveted Hamilton ticket, you can at least hold these truths to be self-evident -- the Hamilton soundtrack can introduce you to this musical’s magnificent lyrics and tunes, Hamilton Mixtape can rock your world with bigger stars than the touring production will have, and you can always just curl up with Ron Chernow’s book Alexander Hamilton on which this musical is based while you wait for them to eventually make Hamilton into a movie. Joe Kukura is a freelance writer and author of the 1776 “Thrillist Federalist Papers” that argued that every American man, woman, and child ought to just sit home and watch a movie or a game every Sunday. You can duel him on Twitter at @ExercisingDrunk.